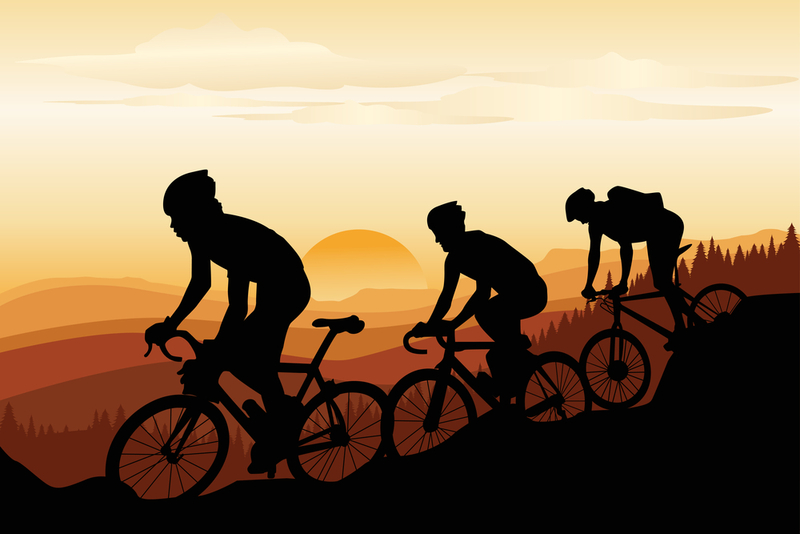 When you are riding to mountain bikes at first, you should look after your safety. Especially if you ride off the road or on rough terrain, a quality helmet can save you from the serious injury that means the difference between making it out intact or suffering significant damage in the event of an accident. In a modern world, it’s very important for people to occasionally reconnect with nature. Fortunately, mountain biking provides the opportunity to see the great outdoors while also staying in shape. Riding along a trail is also very relaxing to offer improved mental health as well. The fresh air and trees are also good for the respiratory system. It’s also important to stay safe while riding a bike and this safety begins with finding the best mountain bike helmet. Fortunately, there are a variety of helmets available, but it can be tough to decide which product meets your needs. The following review compares the most popular bike helmets on the market. There are many helmets on the market, and their efficiency will depend on your riding style, head shape, and more. So how do you know you’re buying the best mountain bike helmet? Today I’ll be showing you some of the best mountain bike helmets, as well as show you what to look for when purchasing. First on our list of bike helmets is the Schwinn Thrasher Adult Helmet. When it comes to biking, Schwinn has always been one of the top brands in the sport, making both high-quality bicycles and helmets. Some essential elements of the Thrasher Adult are the 21 integrated vents for maximum airflow, a built-in visor to increase shade from the sun, and adjustable webbing to make a nice, tight fit. In addition to the vents, this helmet also has pads installed that help wick away moisture from the biker’s head. Regarding size, the Thrasher can fit most heads measuring between 22 ⅞” up to 24”. To adjust, use the strap provided in the back of the helmet. As far as any negative aspects to the helmet, the only thing I have noticed is the quality of construction. Not for the main headpiece itself, but all of the little accessories. The visor is attached with plastic pins, the interior pads are placed on with small velcro strips, and the plastic exterior feels a tiny bit lose. However, this is to be expected for such a cost-effective piece. This is a sophisticated-looking helmet with a heavy rugged outer shell. The helmet has 23 air vents for with over-brow ventilation that enables air to move into the helmet with minimal resistance. Users of this helmet are therefore assured of reduced heating, with an additional rapid-drying anti-odor lining inside. It comes with a unique TAG fit system that caters for user fitting preferences and can be calibrated using a knob at the back of the helmet. For additional safety, this helmet can be fitted with a chin bar to protect the chin area, though this has to be purchased separately. Though it is equipped with an in-built visor, users who would rather wear goggles are not bound to encounter any problems while doing so. This is because the visor can be flipped backward to create room for any eye accessories that one may want to use. This helmet also has an interesting feature for riders who would like to record their adventures with cameras. It comes with an integrated camera mount at the front that can firmly hold most cameras. This mount has been designed to detach from the helmet during heavy impacts, so as to prevent an additional risk of injuries to the user. Finally, we come to another model by Giro Feature Mountain Bike Helmet. Looking at this unit, the first thing you notice is the fact that it seems like a hybrid between a motorcycle and a mountain bike helmet. The shape is much more rounded, which has the added benefit of providing extra protection for the back of your head. Much like the Fox Flux Helmet, the Giro Feature Helmet is designed to cover more of your skull than most traditional units. Like most Giro models, the Feature also has an adjustable visor, all matte black design, and is made of high-quality polycarbonate with an EPS foam interior. What you will also notice about this model is that it only has 12 vents for airflow, but they are strategically placed, so the helmet still doesn’t get too hot while riding. 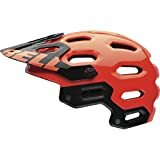 Next on our list of mountain bike helmets is the Bell Solar Helmet, which I assume, is so named for its bright red color. Bell has a long-standing history of making high-quality helmets both for motorcyclists and bicyclists, and the Solar is no exception. Safety has always been Bell’s first commitment, and this unit is rated by the US Consumer Product Safety Commission, so you know that it is a high-quality helmet. What I also like about this helmet is that the EPS (Expanded Polystyrene) foam was inserted and molded along with the outer shell, instead of attached and reassembled later. This process means that the Solar Helmet is much sturdier and robust than other helmets that opt for the two-step method. The only helmet is not prevented by an accident you should wear the best running shoes, Hand gloves for cycling and also biking safety clothes. While attaching EPS foam to the shell afterward is not necessarily a bad thing, the fact that Bell chooses to go this route shows the company’s commitment to excellence and safety. Another high-quality manufacturer of bike helmets is Giro Hex. Whether it is sleek racing helmets for motorcyclists or sporty units for the average cyclist, Giro knows a thing or two about making a lightweight, durable, and top-quality helmet. Although Giro is a little pricier than other brands, such as Schwinn, you are paying for extra attention to detail that is present in all Giro helmets. 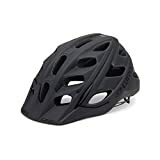 In this case, the Hex Mountain Bike Helmet is a perfect example of the company’s rugged designs meeting high safety standards. What stands out about this helmet is the sleek all-black matte design. This helmet also features an adjustable visor and proprietary Roc Loc technology for adjusting the size to meet your needs. Overall this is one of the most durable helmets out there. 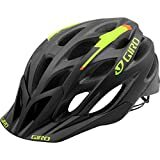 Giro is known to manufacture some of the best mountain bike helmets, and it is no surprise that we have featured a second product from them on this list. The Giro Hex helmet is constructed with a polycarbonate compound that provides it with both strength and durability. The exterior is perforated with 27 air vents that provide effective cooling through an effective interior air-channeling structure. Although it is relatively heavy compared to other helmets of the same class, it feels comfortable and fits well, thanks to Giro’s Roc Loc 5 fitting system. The visor has been tightly fixed to the frame, and it can be adjusted vertically to up to 15 degrees. This helmet offers solid protection and is beautifully constructed, with a modest but stunning masculine look. This helmet has been constructed with a rigid polycarbonate shell, with a polystyrene liner inside it. This combination of materials makes the helmet amazingly light, while still being strong enough to handle hard impacts without breaking. It also has 17 air vents around it, with an interior airflow channel to ensure continuous air circulation within the helmet during rides. This feature prevents heating within the helmet that would otherwise cause a lot of discomfort to the rider. The helmet has a retractable visor that comes in handy whenever there is a risk of objects or water getting into the rider’s eyes and nos. This visor slides back smoothly into the helmet whenever it is not needed. 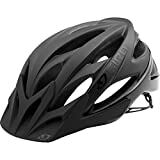 And as an extra bonus, this helmet is able to comfortably accommodate any head shape thanks to its In-form fit system that is adjusted through a control knob confirm to the perfect fit. Much like the Solar Helmet, this Fox Head Flux Mountain Bike Helmet has nothing but the style all over it. Featuring a multicolor camo design, the Flux Helmet is sure to get you noticed out on the trails. However, just because Fox added a little bit of wow factor to this helmet doesn’t mean that it is any less safe or comfortable than the others on this list. The most notable feature of this helmet, besides the color scheme, is the fact that it protects much more of your head than most mountain bike helmets. Other models sit relatively high on your head, exposing the back of your neck almost entirely. The Flux helmet, however, has a much deeper inset, so you get much more coverage than most other models. That being said, though, with 20 dynamic air vents to help eliminate heat, this helmet is just as “cool” as anything else out there (pun intended). One of the most important aspects of a bicycle helmet is how well it can withstand a collision. Most helmets are made of a polycarbonate shell with an expanded polystyrene foam interior, which is perfect for absorbing impact and dispersing weight. When looking at a mountain bike helmet, make sure to check the durability of the materials to ensure maximum safety. If you’re riding around and your helmet is falling off your head or is sitting loose on your skull, it may do more damage than good in the event of an accident. When looking at helmets, make sure to try it on and see how it fits to size. Most helmets are adjustable, but even still many models come in a particular size, like medium or large. If you’re looking at helmets online, then measure the size of your head with a string, making sure to go around the outermost part of your forehead and the back of your head for accuracy. Then, compare the string to a ruler or measuring tape to get an idea of the size of your head. Since most helmets have a foam interior, the weight of the unit itself is rather small. That being said, though, some helmets can be relatively heavy, which can have a significant impact on your neck over extended periods of time. Even if it doesn’t feel so thick when you try it on, imagine wearing it for several hours while keeping your neck arched and decide if the weight is too much if you want you can carry a helmet with your backpack. Ideally, your helmet should be light enough that eventually, you don’t even know it’s there. Along with the expanded polystyrene foam, many helmets come with extra padding for comfort. Additionally, most helmets come with air vents to allow air to flow through the unit, keeping your head relatively cool. When choosing a mountain bike helmet, gloves check out the extra padding as well as the straps to make sure that they feel as comfortable as possible. Remember, if something is a minor annoyance now, it will only be a hundred times worse while riding for hours. Since it’s your helmet, make sure it’s as comfortable as possible. Finally, when choosing the best mountain bike and MTB helmet, take into account any added features it may have. These added bonuses could include a visor for extra shade, removable padding for better comfort, chin bars for extra security, and even a hair port for ponytails or any other type of long hair. When making your decision, take into account the type of riding you will be doing, as well as how often. This should help you determine which features are necessary and which are a luxury that may not be worth the added price. If you are a cyclist you can be forgiven for wondering if a bike helmet is essential after all, they are often uncomfortable on long journeys, can look awful no matter how color coordinated and cannot guarantee that you’ll be able to get up from a road traffic accident unscathed. But before you throw away your padded fluorescent hats, you should be aware that a bike helmet does offer more pros than cons. Firstly bike helmets help protect your skull and face from injury in the event of an accident. While it cannot guarantee that you will be safe, the wearing of a helmet significantly improves your survival rate in the event of a collision by cushioning the skull and thus the brain. The less shock to the brain, the better your chances of surviving a crash without brain damage. Secondly wearing a helmet can help other road users and pedestrians identify you from the crowd. You might not like drawing attention to yourself on foot, but when bike riding you need all the attention you can get. Bicycle accidents are on the increase throughout the world as roads become more congested and drivers spend less time looking for two-wheeled vehicles. Finally, bike helmets offer a fantastic solution to the many incidents of road rage that can often be found documented on platforms like YouTube. This solution is helmet mounted cameras which are not only small, easy to use and can record in HD but offer the bike rider evidence of dangerous driving in any road related incident that they might have to deal with during their ride. When looking at the helmets on our list, I have always been partial to the Bell brand. I have had numerous Bell helmets over the years, and I especially like the company’s commitment to safety for its customers. That being said, though, I do like the features on the Fox Flux Helmet and the Giro Hex, so if you are not as partial to Bell as I am, either of these will work. Finally, however, if you are just looking for something quick and cheap that can still protect your head, the Schwinn would be my recommendation. However, when it comes to safety, money shouldn’t be a deciding factor, as your life is worth far more than a cheaply made helmet.